Bathing is one of the times that are a just for me, where I can sit back relax, read, or even watch a show or movie. If I have already washed my hair I like to use a hair towel to keep my hair up and out of my way. This is one of my favorite luxuries besides face masks, bubble bath, and bath bombs. As a busy mom there is precious little time for a little pampering or luxury but with these Microfiber hair towels from Bath Blossom you are in for a real treat. Super easy to use just place on your head after leaning forward with hair coming in front of face, twist lightly, lift, and button. That is it for a great way to help dry your hair and keep it out of you face while washing face, using masks, or even while putting on makeup. My girls even love these hair wraps which cut down on drying time on busy school mornings. 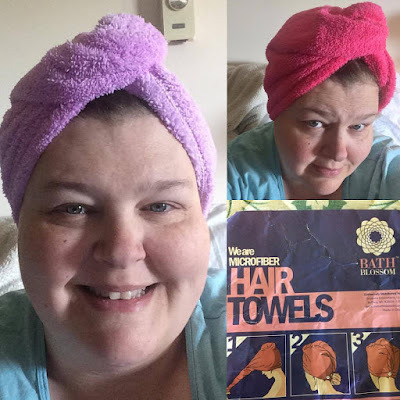 The Bath Blossom hair towels come in a twin pack which can be found at my affiliate link below. Disclosure: MarksvilleandMe received one or more of the products mentioned above as part of a promotion with Tomoson and Bath Blossom. Regardless, MarksvilleandMe only recommends products or services we use personally and believe will be good for our readers. Some of the links in the article may be “affiliate links.” This means if you click on the link and purchase the item, I will receive compensation. If you would like MarksvilleandMe to review or promote a product or service please contact us at marksvilleandme@gmail.com.